Take a Boat Trips right from Pier 8 in Boothbay Harbor. 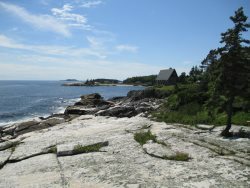 The most popular is the all day trip to Monhegan Island. Also offered is a one hour harbor tour several times daily and evenings, sailing trips, 2 hour mackerel fishing and the Burnt Island Lighthouse tour. Seasonal. Sail aboard the Lazy Jack Boothbay Harbor`s only historic schooner. Help set sails or just relax while exploring the outer islands and lighthouses of Boothbay. Enjoy fishing and exploring the Coast of Maine with an experienced Guide; shallow water fishing trips for 1-4 people; inshore light tackle fishing-mackerel, stripers and bluefish-on 19' Seaway T-Top with Ray Marine Electronics; gear included. Canoe and Kayak sales and rentals. Our extensive rental fleet contains the most up to date models available. We also carry canoe and kayak accessories such as: PFD Jackets, Canoe Seats & Back Rests, Roof-Top Carriers, Skirts and Rim Covers, Repair parts, Tie Down Straps, Trolling Motors, Paddles, Boots, Gloves, Wet Suits, Safety Equipment and Trailers to name a few. Pick Up and Delivery at all of our cottages can be arranged. Cap`n Fish`s Whale Watch is Boothbay Harbor`s ORIGINAL WHALE WATCH and has been Whale watching longer than anyone in the region. A family held corporation for three generations, Cap`n Fish`s Whale Watch is the premier choice for experiencing the whales, sea birds and marine wild life that the Boothbay Region has to offer. Boothbay Harbor is home to the Eastwind, part of the Maine Windjammer Fleet. Enjoy a two-hour voyage aboard Boothbay Harbor`s largest schooner, relax and see the Maine coastline, places only accessible by boat, such as Lighthouses, fishing, lobstermen, wildlife, and remote islands. Enjoy gliding over the water powered by wind in the sails. You might even get to see whales and seals swim along side you. Nothing better than a good wind in the sails to send you skimming across the ocean.